It's been a busy time with the International Food Exhibition (IFE15), judging the Great Taste Awards and visiting VegFest in Brighton. At IFE15 www.ife.co.uk at London Excel www.excel-london.co.uk I was delighted to find so many free from products not only gluten free, but dairy free as well. Interestingly most of these were located in the "Health and Wellbeing" section. Congratulations to Clive's Pies www.clivespies.com for winning the Best Free From Product in the World Food Innovation Awards 2015 for its gluten free pies. What's more they are virtually all dairy free as well except for a few varieties such as Homily Pie and Cheese and Potato. At the show, I sampled Mushroom & Leek pie. Most pies I've tried before made with gluten free pastry tend to be doughy with dried out fillings, but not this pie. The pie has crispy pastry with a generous moist tasty filling. A real treat. That evening I heated up the Aloo Gobi pie, with cauliflower florets, potatoes and vegetables in aromatic Indian spices with fresh ginger and coconut cream. It was a similar story - melt in the mouth pastry and a yummy filling. Ray, who's dairy free, was over the moon. "This is the best pie I've tasted," he said. "When can we have another one?" Pies are available already cooked in single packs, so you can eat them cold. The pies are also available uncooked in twin packs. 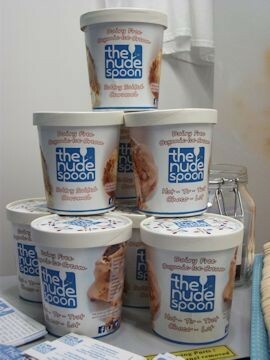 You can buy them online or from independent health food shops, Holland & Barrett, Ocado and Goodness Direct. Walkers www.walkersshortbread.com is synonymous with quality shortbread. As a child, I remember my mother buying it every Christmas as a treat. 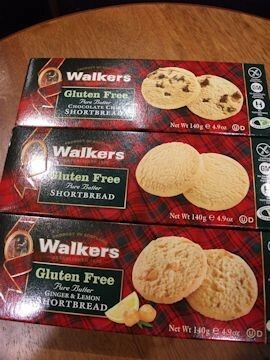 Imagine my surprise to discover that Walkers has launched gluten free shortbread. Tasting it evoked memories of my childhood. It's truly delicious and not over sweet. Available in three varieties - Pure Butter, Chocolate Chip and Ginger & Lemon in 140g boxes. 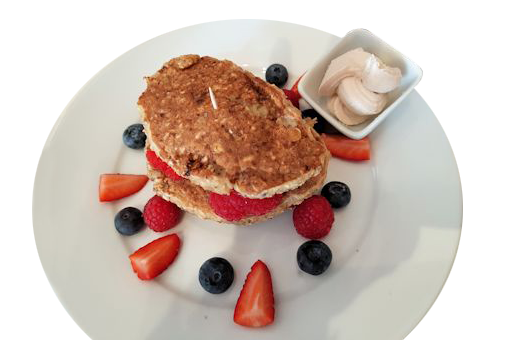 The shortbread is made with a blend of potato, rice and maize flour and carries the Coeliac UK certificate. 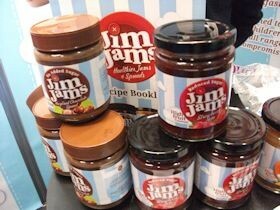 When Kevin Bath was looking for a chocolate spread for his children, he was shocked to find that they contained so much sugar, so he decided to make his own and thus Jim Jams www.jimjams-spreads.co.uk was born about ten months ago. Its gluten free chocolate spread contains 83% less sugar than others on the market. Jim Jams also offers reduced sugar jams. Kevin says "When I was researching the market, no company does the whole range - it's either chocolate spreads or jams." Chocolate spread is in Milk Chocolate and Hazelnut varieties, while the reduced sugar jam is in Strawberry, Raspberry and Blackcurrant. There's also Orange Marmalade. I was given a recipe leaflet, although there are recipe ideas on the web site. The Berry Jam and Vanilla Swirl Cheesecake looks amazing and is definitely one to try! 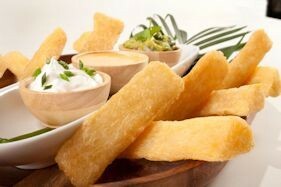 For something different, I sampled "Yuca Fries" on the Funnybones www.funnybones.co.uk stand - delicious. Funnybones is a foodservice company providing products to caterers. The fries are made from cassava (also known as yuca), a root vegetable native to Central and South America. Also on the stand was a range of gluten free bread. The Great Taste Awards www.greattasteawards.co.uk organised by the Guild of Fine Food, is the acknowledged benchmark for speciality food and drink. It's been described as the "Oscars" of the food world and the "epicurean equivalent of the Booker prize". When you see the Great Taste logo on a product it means it's a sign you can trust when buying food and drink. Now in its 21st year, the number of entries is capped to 10,000 and over 400 judges blind taste the products over 50 judging days from April through to mid July. And I was one of them. I sampled a wide range of products including seaweed crackers made with gluten free beer, dairy free lemon chilli curd, poached duck's eggs, a blend of English Cox apples and lightly sparkling spring water, Tayberry ice cream and a brownie which was egg free, dairy free and gluten free.